"Thus it did come to pass that the form of the Great Heron stooped over the land near the great sea. Between the land and the shore his mighty feet pressed down into the ground, and when he lifted them again, the waters rushed in to fill his mighty footprints. Satisfied, the great heron flew North, and with his long beak began forming mounds of the earth, rearing tall mountains. In the beginning the mountains were soft and pliable, and the heron spread his wings and body over them as a bird over her eggs, until the mountains had dried and become hard and everlasting. The tallest mountain he called Akkat, the sentinel, for it's snowy crags looked out upon the land for hundreds of miles in watchful silence. Striking the rocks with his beak, the great Al-Kadde brought water from the rocks, which flowed down from the mountains through a wide channel which he carved with his beak. As the water sought the sea, Al-Kadde created great, rolling hills to the Southeast, though these he did not sit upon, and the hills were not hardened as rocks are hard. The river he called Suri, the mother, for through the river Al-kadde would bring life to his lands. Finally the waters of Suri reached the sea, flowing into the footprints of Al-Kadde to create a great river delta, full of fertile land and suitable for the beasts of the field, the creatures of the marsh, and the fish in the sea to all come together to honor Al-Kadde. And in that river delta Al-Kadde did create a cycle of floods upon the river every year, which kept the land fertile and young by spreading rich soil and silt along the river delta. Al-kadde likewise calmed the cold north winds during the shorter days, and the fierce heat of the sun on the longer days, and in this manner the seasons upon the river delta became ever-pleasing to Al-Kadde. And Al-Kadde surveyed the seat of his power, standing ever-watchful, the Guardian Standing at the Gateway between land and sea. Hom shaundi ecu." In the earliest days, when the land was still soft from the bodies of the terrors in the dark, our Lord did see that the darkness hated the light that he has wrought. The demons within sought to ever extinguish our light. And so, our Lord went into the darkness. He sought out the tallest, largest demons within the darkness, and destroyed them. With the giant bones bred from darkness, and flesh made of evil, our Lord did craft mountains reaching into the sky, creating a barrier from the darkness and blocking out the terrors. Brinfar the Always-Burning pressed his hands into the land, and under them the grass burned to ash, and the soil dried to sand, and the land shriveled into the first desert. From the Mountains That Reach The Sky, our Lord did gaze out upon the sanctuary he had made. From the corpses of evil, foul blood drained out, corrupting and blackening all that it touched. Knowing that life would not be able to spring from the foulness amid the dead land, our Lord did strike deep within the bodies of demons and cleansed the foulness from within by digging out the foulness deep within the Mountain. Only then did pure, life-giving aqua vitae began to pour from the wounds of the Mountains, allowing life to spring from even the blackened corruption. Brinfar, the Always-Burning finally gets around to making the desert actually have a desert climate (shape climate K6 and L6 = 4 pts) and sets his fiery throne in the island in E2, now ashen, rocky, and dominated by a single, huge volcano (shape land E2 = 3 pts). In the second [round] of the first age our Lord Stephanos bringer of light and life, healer of the weak and protector of virtue, the soul of the world and holder of truth, brings forth three "gardens" - squares of temperate grass land with frequent copses or fruit trees, abundant berries and birds, and fields of waving grain where the people will be comfortable and at ease. He does not envision the chaos and strife such gardens of plenty may have in later days and seeks only to prepare for his followers creation. The Maw will continue to eat his way south through squares Q5 and Q6 and bank the 2 points remaining for the future. When Helene the Healer saw the violent scars upon the land, her heart ached and she yearned to soothe the marks of suffering. She chose to soften the point of the Maw's Chasm by blunting the shoreline into white sand beaches and rolling dunes, the velvet grass leading up to the edge of the sharp drop-off. She spends 9 points to ease the landscape of P3, Q3, and Q2. And Lo, thought the barren planes of the world shuddered not under the trampling foot of that which walked, the ground shall open up and forever know the touch of its masters... I command the breaking of a rift, forever breaching the peace of the world (Shape land, square G15, 3 points). And from that gaping maw did the laughter of the unnamed one come, ringing in the ears of the lesser gods, and with laughter they came. Them, without name, they crawl and lope, and fly, the first beings, those with shape primordial (Create Race - of inconceivable cthonic creatures, 22 points). In the shadowy light of the dawn of the world, and founding the first days, the ancient and eternal are awakened upon Primordia, aimless, guileless, and without knowing their purpose, but for the laughter of their god, they find no solace nor mercy. And as his mirthless laughter awakens the pained cries of his offspring, a warning to those other gods who tinker with the sloughed shell of the world, digging and spitting as befits their lesser nature. These are my children, formless, to be monsters and angels at my will. Should you play with these toys of mine, I shall show you that my games are more painful than yours. The chaos rift itself is a shifting dark mass of smoke, fog and shadow, it t is a deep open and jagged hole. Somewhat similar in appearance to a large open pit mine, it is central to a craggy valley set amid rocky hills. The landscape of G-15 generally has broken up, from standard verdant plains, to include more rocky canyons and stone hills. The hills are low, and going over them is possible but hard and dangerous with loose rocks and sharp drop offs, the pathways between are confusing forming a maze of inhospitable dead-ends and long narrowing gullies. From the walls and cliffs, the wind breaks off rocks that tumble below and most of the low ground is scattered with jagged rocks. The broken up rocky landscape offers plentiful caves as shelter for the new race and those animals that remain. While small streams and rivulets of water are spring fed, providing clean water and low channels that become torrents when it rains. Brinfar simply extends the reach of his burning desert, growing it into the J5 and K5 squares (shape land and shape climate for 10 points). The Lord did look out upon the life-giving marshbeds and saw that his work had begat life. Such life was pleasing to his gaze and thus, he dragged his hands behind him as he crossed the land, spreading aqua vitae throughout the land. As his fingers changed his land, so did his breath change the air. Harold the Thunderous and Massive had been sleeping since the great celebration heralding the Dawn of Time. Well, passed out drunk would be more accurate. Despite his hangover, he had amassed a tremendous amount of energy. (27 points worth) And a tremendous hunger for ale. "Who will bring me a tankard of hops, barley, yeast and happiness?" he asked the world, but he heard no response - nothing but the laughter of some of the other gods, and the writhings and mutterings of the cthonic ones that lurked under the land he now lay upon. And Harold the Eternally Thirsty was pleased. And then he realized that he was a terrible brewer. "Och. I need ale, not a series of ingredients and recipes... Who shall make me an ale?" And so, Harold the Flatulent and Alcoholic created the race of Dwarves - bearded men and women of about 4 feet 8 inches, with a penchant for hard-work, creativity, and brewing. After a time, the Dwarves came to understand Harold's nature, and they would scale the mountain called "Harold's Seat" on yak-back and leave kegs of golden ale, red ale, and porter for him to enjoy at his leisure. One time they left a keg of weak lager, and Harold the Vengeful made the heavens rain fire and agony upon Dwarvenkind. That was a terrible mistake. As the Keymaster would one day remark, "Many Shuvs and Zuuls knew what it was to be roasted in the depths of the Slor that day, I can tell you!" In order to reinforce the benevolence of the gentle coastland of squares P3, Q2, and Q3, Helene the Healer shall spend her paltry 6 points tempering the climate there to abhor extremes of temperature and maintain a pleasant atmosphere of moderate humidity and caressing breezes. And so it was that Al-Kadde, Sovereign Lord Over the Borders of the Land, Sea, and Sky, Bringer of Storms and Floods, Meter of Justice, watched the developing world in silent judgement. Stretching forth his mighty wings, he swept them across to the sacred East, and did brush the lands with his outspread feathers. At the touch of his feathers, rolling hills did arise, running down to a rocky shore with deep inlets. In the lands where the tips of his wings came to rest, the shore became sandy and pleasing to the eyes, and the sand gave way to long grass which gave way to verdant forest. The unnamed one expands the hills and rough terrain of the chaos lands into [I meant to say F15, F16 and G16 the curve around at the bottom] which is three squares but less than 2 in map surface. Paying 6 points for 2 actions of shape land. 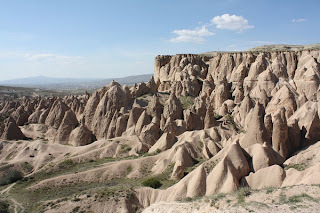 the land looks like Cappadocia in Turkey. Please turn C10-C12 into bog/swamp land, and extend the river system into C12. A fen, if you will: neutral to alkaline, groundwater-fed. Mineral-rich environment with a variety of plant life. No woody plants. Grasses, sedges and moss. Some carnivorous plants. YUM! The Maw That Devours wakens from his slumber and begins to travel a wandering path to the north from wenst him came, continuing to void his might bowels and covering the barren lands with his fertile wastes. The Unnamed one shapes climate on the Verdant Southern plains, they become Savannah (F14 - G14 - H14 - H15 - I 15 - I 16 - J 16, Presuming a fractional space can be combined for effect) These spaces retain the flat rolling grasslands of their origin in primordial time, but the climate stabilizes into a very even and unchanging one, warm air off the southern sea and mountains on the west causes the predominant wind to be from south to north, and prevents freezing and snow even in winter, though it can be quite cool at night. Stable compared to changeable temperate seasons, in the fall and winter (the rainy season) is mostly early morning and evening showers happening as the temperature changes. Then Al-Kadde, Sovereign Lord Over the Borders of the Land, Sea, and Sky, Bringer of Storms and Floods, Meter of Justice, looked to the sun as it rose over the lands to the east, and saw that they were barren and displeasing to the eye, providing no separation between the lands to the North and the sea to the South. Thus is was that Al-Kadde voiced a mighty cry, and the land itself trembled, the ground rising to praise the name of Al-Kadde. At his command, the earth bore forth trees of every shape and size, some bearing fruit, some bearing nuts, creating a great rolling forest. Then with a sudden gust of mighty winds, Al-Kadde took to the winds, with the Sentinel Mountain at his back. He flew many hundreds of miles before setting his divine clawed toes upon the Lobabun, Island of Mist. This place he would make the seat of his justice, a place of wrath poured out onto the world, a place from which the storms would come and where thunder would be born. Al-Kadde gathered the rocks together to form high mountains in the center of the island. The tallest of these mountains he hollowed out with his beak. From the tip of the mountain Al-Kadde spread the mighty expanse of his wings and ascended into the heavens to the very Orchard of the Sun, from which all life is given. Al-Kadde with his beak plucked the smallest of sun-fruits (which only the gods can take), and brought the sun-fruit to the mountain and planted it deep within the bowels of the rocks. The earth shuddered and filled with fire where the sun-fruit touched it. The fires rose and threatened to spill from the hollow mountain, but Al-Kadde caused the flames to subside, for Al-Kadde had also decreed for there to be abundant jungle on the slopes of the mountains. The fire mountain he named "Al-Hisaab" for it would become the seat of his judgement against those who broke with his law. Brinfar (with 11 points) will be expanding the central desert (yet again) into I5 and J6: two squares, shape and climate, at 5 points per for a total spend of 10 points and banking 1. Harold woke up after his extensive post-beverage nap. "That dram of liquid was just what I needed," he said, as he rubbed an aching head. "More! I demand more from you! Bring me ales! And whisky! And Harvey Wallbangers!" His people looked up at him in confusion. "Oh, great, thunderous, and flatulent one, we want to perform well in your service. Tell us of this Harvey Wallbanger, and we will bring him to you!" Still watching the shaping of the world Stephanos warily looks at the foul beasts now trodding the land and encircles his garden in 11 I with a thick thorny wood so dangerous and poisonous its brambles that it is nearly impassable. Stephanos benign god that he is hears the whispers on the wind of brewing and makes the bramble seeds a powerful and flavorful intoxicant for any one brave and hearty enough to collect them and wise enough not to overuse them. This poison thicket shall grow in future to encircle the garden completely but for now it marks the gardens borders on three sides. Lo' and so the blessed Lord did look upon the land and see that it was fit. Life would bloom within these fertile conditions and so the Lord was pleased. He knew that the enemies of the Righteous People shall be many, as the Darkness lies ever at the edges of Civilization. Foreseeing the need for a great and many people, the Lord, most Sagacious and Resplendent, blessed be His Named, laid his hand upon the rivers and land, and extended the Light which is our Birthright. ...extending the bog/luminescent waters further to B11-B12. Harold looked upon the mighty abilities of his brewers improving every day, and laughed to himself. "These are wondrous people with wondrous gifts! These gifts must be shared with the world - and glorify me as the bringer of yeast, hops and revelry! I shall [using 10 points and the Event action] create an everflowing Keg atop my mountain, from which the ale of my people shall flow for eternity. Come peacefully and you may drink of the ale. Come with malice in your hearts and be cast down from my mountain. I pledge to defend my people - and their everflowing keg - for all eternity. So says Harold the Ouch-My-Liver-Hurts!" He, also invokes a Purification on his people [5 Points], making their alignment +1, and banks his remaining 2 points. The Lord knew his followers would be plentiful, and would fill the multitudes. That civilization would spread from his people. And so, He set forth more land, ready for his people. He exhaled over the rest of our birthright, and set forth the conditions favorable to us, his chosen people. Shape Land (A10-B10, A11, A12) - given that some are halves and quarters of actual land, I'm going to call it two Shape Land actions for 6 points. Shape Climate (same) - swamp/bog, luminescent waters, for 4 points. I'm going to extend a mountain range from Akkat in I9 to the northeast, basically coming up to the south under the desert. (Shape land, 4 squares, 12 points, 0 bank). Harold does not wish society to advance. He is furious with his fellow gods for trying to move society beyond our simple paradise, and causes a Catastrophe (10 points) by calling a flaming asteroid from the heavens and smashing it into O-14, vaporizing the oceans in that square (and surrounding squares, if Rob will allow it, leaving a pile of molten land behind in O-14). "I well know that the world will move on, but I do not like it!". And with that, he sulks on his throne devouring spiced pterodactyl wings and quaffing ale. Stephanos extends the poison bramble wood to J12 to complete the defenses of his garden and banks the rest of his points. Brinfar will just extend the desert (terrain and climate) into K7 and L7 because...desert mountains? The critters are coming. They gather. They attach. They secrete. Their crusty little shells accumulate. A lot of them. Miles of them. More critters live on them. They gather nutrients from...where? They create more nutrients for others. The Lord gazed upon His handiwork with satisfaction and knew this would become a place for His Chosen people to thrive. He retired to the glowing lake, that which we now call Matlalcueye, deep within the Mountains That Reach The Sky. He stood within Matlalcueye and started the slow process of creating His Chosen people - those who would carry the Light to the rest of the world, to defeat the rest of the darkness, and to destroy the terrors in the night. Brinfar causes a great lake of fire to erupt in the heart of the desert. With a mighty breath, he then blows the flames to the east, where they escape the sands and race across the land, forming a river of fire that snakes out into the grasslands before coming to a curling stop. The lake and river themselves burn with the heat of the desert, scorching their banks but otherwise leaving the surrounding land unaffected. (Shape land - 3 tiles; spend 9 points, bank 0). Harold looked about him and saw all the change and evolution afoot. "No...Noooo! NOOOOO! This is not progress! This abomination will ruin all that I have built!" Fearing for the safety of his dwarves, he ordered them to build a city (4 pts, Command Race - K2 - Portland, in the heart of the Willamette Valley) and build an army (4 pts, Command City). He hoped they would never have to leave their paradise near the everflowing beer keg, and to protect them began to adjust the world all the more to protect his people. In the land to the west of the Willamette Valley (5 pts, Shape Land, J2) he built a treacherous mountain range...a mountain range that would be filled with a defender in the next round...something that would always be watching and protecting his wee, brewing, fun little people. The Maw That Devours has grown tired and burrows deep beneath the jungle that has arisen from its offal. As The Maw That Devours dreams, his hunger seeps out into the land, driving all life in the jungle into frenzies of devouring. Even the plants begin to hunger for the taste of flesh. The more that they eat, the larger they grow (mostly). One group of animals does not, however. A tribe of small tree dwelling monkeys (Lemurians) finds that as they eat, they become smarter. With their new intelligence they from a symbiotic relationship with certain species of the newly formed Hungry Trees (think the whomping willow, but with vine-like tentacles). They begin to form scattered villages throughout The Hungry Jungle. The jungle is now filled almost exclusively with predatory animals and carnivorous plants. The animals and plants are growing much larger and more aggressive. Even the remaining herbivores have grown larger and much more aggressive. Not sure how the alterations I have made to the jungle will cost, but I am figuring 2 points per square, with an approximate area of the jungle being 9 squares for a total of 18 points. A tree-dwelling species of carnivorous Lemurs, slightly smaller than human. Their villages are formed in the middle layers of the jungle canopy, clustered around the trunks of the Hungry Trees, whom they assist in feeding in exchange for mutual protection from the larger creatures of the jungle. They have begun developing weapons and tools, mostly made from wood and the bones of their prey. From the depths of the abyss, a race rises. On the currents and tides, the merfolk arrive. (6 points-Create Race: Good +1) Fleeing the acidic Western Seas, they gratefully embrace the shelter of the reef (C14), and settle in, adding to the structure of the reef with homes and ramifications, common gathering areas and fishing grounds. A city is founded (4 points-Command Race), but the name can not be spoken above the surface of the water. Translated from the language of Bubbles, it can most nearly be represented as "oOooo". Helene the Healer protects her newly arrived race by bestowing upon them an expert understanding of the power of Weather (5 points-Advance Civilization). The merfolk cannot control weather, but they can understand and use the power of weather to fulfill their needs and ensure their safety. Brinfar reaches a mighty hand to the desert mountains and tears handfuls of orange rock from each peak. From inside the crumbling summits emerges a new race of beings. They are huge, hulking bipeds, thickly built and stooped forward in their bearing, so that their hands rest naturally around the level of their knees, and their heads hang about even with their shoulders. Even with this slouching posture, they are still easily twice the height of even the tallest of the Sahlethek. Their skin is tawny and stony. Their bodies appear assembled from the rock itself. Alert, red-irised eyes peer out from curious, craggy faces. These rocky giants claim the desert mountains for their kind, dwelling mostly in caves both natural and hewn from the mountain faces. They compete with each other for dominance and command, and the greatest of them is named the Great Champion. The Great Champion undertakes a sacred pilgrimage to the tallest of the desert mountain peaks, where it alone is permitted to speak directly to Brinfar. It returns to its people changed -- wreathed in unending flame and blessed with Brinfar's gift of Fire Magic, which the Champion begins to teach to those others among its people that it deems worthy. Such is the right of the Great Champion, and such is the way of the Fire Giants. Time passes as the rivers flow, forward - sometimes fast, sometimes slow - but always forward. Seeing that the land has been prepared, our Lord created the first cohort, spawning the 12 Great Houses from which we all descend. [Create Race (6) - Evil (-1) : Saurians, amphibious biped lizardfolk]. The first cohort stayed beneath the blessed waters as the Lord whispers to us of our birthright to lead this world into the Light, and of the outsiders, the darkness, the demons, the soft-fleshed who sought to weaken us and corrupt us. He told us that from each House, from each Line, there must be those who be given to the Lightbringers, to the Holiest of Orders that shall take up the mantle to ensure that we fulfill our destiny. [Create Order (6) - Saurian Priesthood (called the Lightbringers)]. When the First Cohort birthed from their eggs into Matlalcueye, the Lord reached into the darkness from whence he slayed the demons and drew forth the flesh of our enemies. And so the First Cohort feasted upon the flesh of dead Gods and gained their power, and grew strong. [corrupt civilization (3): -1] Strengthened, the First Cohort did then beget the Second Cohort, who begot the next Cohort, and so forth. Upon those sacred waters of Matlalcueye, did we constructed our greatest city, the eternal seat of our people, Chalchiutlicue. [Command Race (4): Build city]. Shape Land J3, create mountains. Harald rages against progress and adds more mountains to protect his people. Within the Devouring Jungle live the Lemurians. They make their homes sheltered with the branches of the Hungry Trees. The Tree protects them from the large predators that roam the jungle and they ensure that the Tree eats well. When the Tree hungers it grabs nearby living creatures and stuff them into its feeding maw. The Lemurians see it as their duty to make sure the tree is fed. They lure creatures into range for the grasping limbs of the Tree. If the Tree grows particularly hungry it will feed on the Lemurians. This is seen by the Lemurians as a failing on their part and so efforts are made to make sure the Tree gets plenty to eat. When the Lemurians hunt and kill, they always give part of their kill to the Tree. The Trees have two orifices, a mouth for eating and and lower orifice which ejects the indigestible materials from its food, mostly the bones. Bones that have passed through the Tree are considered blessed by the Lemurians as the bones are found to be stronger and sharper then they originally were and the Lemurians use these bones to make their weapons and their tools. As the Maw That Devours slumbers the Devouring Jungle slowly expands and absorbs the untouched land to the north. Brinfar, fascinated by the molten crater island left behind by Harold's asteroid crash, decides to visit the area. The ground here is strange -- soft like wet soil, but as dense and strong as rock. He kneels and slowly sinks both hands into the ruined earth, first to his wrists, then to the elbow, then beyond. Soon his face touches the surface, and that, too, he submerges into the ground. He inhales slowly but deeply, breathing in the savory, alien tastes of this new land. He withdraws from this communion, opens his mouth, and ejects a breathful of clay and silt and sputum. The effluvium seeps back into the ground, and from this mixture arises Slag. Slag is a roiling mass of intelligent, wet clay or molten rock or goopy sediment. Slag roams the crater. Brinfar whispers to Slag. Slag extrudes a pseudopod to reach out from itself. The pseudopod's connection thins and thins, eventually to nothing. The pseudopod is separate. The pseudopod is free. The pseudopod is also Slag. Slag reaches out again. Another budding, another Slag. And another. All Slag are Slag. Slag roams. Slag grows. Brinfar whispers again to Slag, and Slag builds a home -- becomes a home. A group. A hive. A city. Home is The Heap. In time, of course, Slag reaches an edge of the island and encounters the sea. Another pseudopod is grown; another Slag is born. Slag oozes down the shore and into the water. Slag moves under the sea. Slag heads for the opposite shore. And Harald looked upon the threats forming around the world, and he realized that isolationism would not protect his wee, alcoholic people. "They must learn to protect themselves... And perhaps make themselves known..." And so, donning a hat that had the phrase "Make Portland Great Again" Harald Advanced Civilization to teach the Dwarves to be effective and nefarious warriors (Warfare). 5 pts. The appetite of the Hungry Trees grows greater as they grow larger and so the need to feed them drives the Lemurians to hunt, some Lemurians begin exploring to the very edges of the Devouring Jungle. One tribe is driven away from their tree and out on to the narrow beach at the edge of the Great Salt Water. They subsist by scavenging the flotsam and jetsam that washes up on the sands, until one day they discover the huge body of a great ocean beast, a leviathan, washed up on the shore. The tribe harvest the massive bones of leviathan and trade them to the tribes who still control their own trees. While it takes years for the massive bones to pass through the tree's digestive system and become hardened, the quantity of weapons and tools that can be Bonecrafted from them provide those tribes that can acquire levithan's bones with great advantage over the other tribes. The treeless tribe on the beach begin to study the ways of the water and the things to wash up on shore. Combining the knowledge that wood floats on water with selected Bonecrafted components allows them to construct at first simple ships, allowing them to hunt close to shore. Necessity quickly drives them to construct larger and faster ships, allowing them to travel further out on their leviathan hunts. The bay comes to be named Leviathan Bay. Advance civilization (5 points): Ocean-going ships. Additionally the Lemurians explore an area of ocean a full square out from the edges of the Devouring Jungle, including the area Q8, Q9, and R9 which they name Leviathan Bay. Awright, I'm behind on everything, so my turn this round will be 2 points contributed to the Maw's sailing venture, and a 4-point Command Race for the Slag to emerge on solid ground and found a new city called the Step on the little tip of the cape in N14. Long ago before there was time, and when there was just grey and no light and dark, and before the trees were born - the gods came into being from what was left of the world before this one. There had been many somethings that had each in the end become tiny nothings. From that seed of magic spirit and matter the creators were born and our age was begun. The young gods were growing, and they said what a barren and tiring rock. They looked about and seeing nothing else in the existence they decided to make something. They blessed them making the nothing into our world. They each set about creating the world. At first they created the land and the seas and the wilds. Eons later when the mountains were still young and the sky embarrassed by its translucence the gods and goddesses decided life and spirit should take form. They shaped them with will and freedom and the power of creation. The gods and godesses were busy making all the walking, flying, crawling, swimming, floating, running, hopping, and breathing things. They blew life into everything from the humblest insect to the grandest dragon. Stephanos looked and saw the other gods at work: the dwarves formed of Earth into stout and lumpy figures. From water and mist they created the merfolk and frog kin. Of leaves and bark the lemurians grew in nature. And all the other creatures of the world seething and foul formed from wind and light, leaves and bark and seeds, and the fire giants formed from fire. He gave one commandment to Snamuh to behold the might and majesty of Stephanos and do good.To watch over them he created two races of creatures of pure magic Shades and Faeries of light and dark. Faeires to teach the Snamuh lessons and lead them on the right path and share his love. Shades of dark claws and shadows to guard the dark thorny forest around the gardens. To keep Snamuh in and other races out. The Snamuh however proved too chaotic and earned his anger when they snuck out to discover the world beyond the gardens. Create Order (6 Points) Snamuh Explorers who went beyond the wood.